Full disclosure: the Retirement Living Center is a company that makes money by referring retirees to senior communities listed on its website or by arranging residents’ reviews of these communities. But the state tax website is free and publicly available. Just a heads up – we may not have a state income tax here in WA, but our sales taxes are quite high (varies by location but generally just below 10%). Be sure to check out the whole picture before making your decision. Don’t let the tax tail wag the dog! Good to know Nancy. 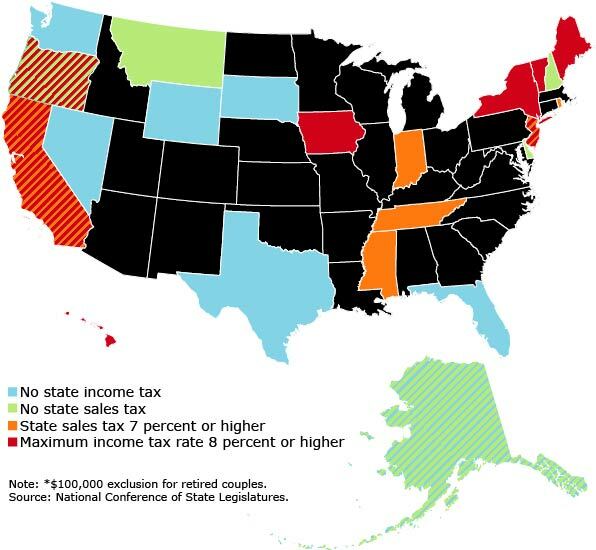 The NCSL says Washington state’s sales tax rate is 6 percent. Do you also have local sales taxes on top of that? Every 2017 combined rates mentioned above are the results of Washington state rate (6.5%), the Olympia tax rate (0% to 2.4%), and in some case, special rate (0% to 2.2%). There is no county sale tax for Olympia, Washington. The Olympia’s tax rate may change depending of the type of purchase. So CRR is encouraging retirees to live in places that don’t spend as much on debts and public employee pensions? That has a lot to do with the tax burdens on that map. In 2009 we moved from California to North Carolina and in 2014 we moved back to California. Before each move we checked tax rates, however, it was not the first thing we checked. My advice is to first check that the lifestyle is consistent with your preferences because that is the highest priority. When you check tax rates, you should do a detailed analysis of your specific situation. In our case, we pay far less state income tax in CA than NC. NC has a flat, 5.75%, tax structure. CA has a very progressive tax structure resulting in our paying a marginal rate far lower than 5.75%. Finding the right balance for your situation is key to keeping your tax burden down. How income is generated matters, of course (income taxes), but so do your choices on whether to own a home or rent one (property taxes), what kind of consumer you are (sales taxes), and more. In some cases, states may have low sales or income taxes, but raise revenue in other ways, via “intangible” taxes: vehicle registrations, gasoline taxes, and so-called “user fee” public items such as toll roads or entrance fees for state parks. It can be difficult, but you need to see where your lifestyle fits into all these intersections to determine what your actual effective tax bill will be.